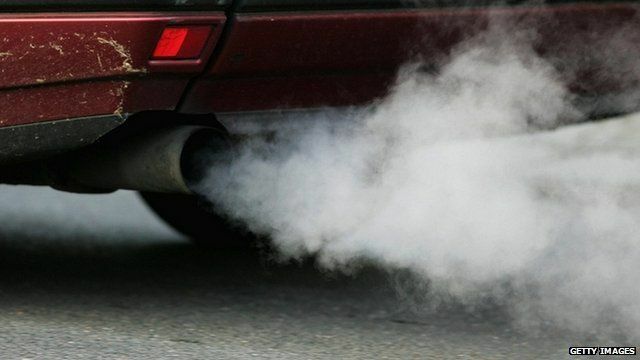 Two of the Midlands' biggest cities are breathing in record quantities of nitrogen dioxide. According to a recent study, Leicester has the highest levels of nitrogen dioxide in England, with Nottingham recording the second highest. Both have some of the highest levels in Europe, putting them 9th and 11th in a table of European cities. The majority of the pollution is caused by vehicles on the road and experts say reducing traffic in the cities is the best way of improving air quality. A BBC Inside Out investigation has found that the concentration of nitrogen dioxide outside of a primary school in Leicester is above recommended levels set by the World Health Organisation (WHO). A team of researchers from the University of Leicester found that the concentration of nitrogen dioxide outside the school during peak hours, was above the levels that the WHO lists as damaging to humans. The health risks of inhaling this gas are not fully understood but it is known to cause problems for people with respiratory conditions like asthma. Inside Out East Midlands is broadcast on Monday, 28 January at 19:30 GMT and nationwide on the iPlayer for seven days thereafter.